Above is a generously long look at a new Rainbow Six Siege map, which is playable in the current closed alpha. The video above is a leak so it's not likely to last long, but it provides a neat look at how the forthcoming shooter looks in action, as well as how setting up barricades and waist-high cover will work. Rainbow Six Siege is expected the release towards the end of the year. Shooter wizard Evan Lahti had a go at E3 2014 and came away impressed. 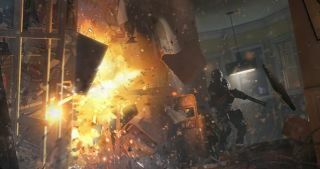 "This E3 demo sold me on Siege's potential as a competitive multiplayer FPS, something the PC desperately needs more of," Evan wrote.